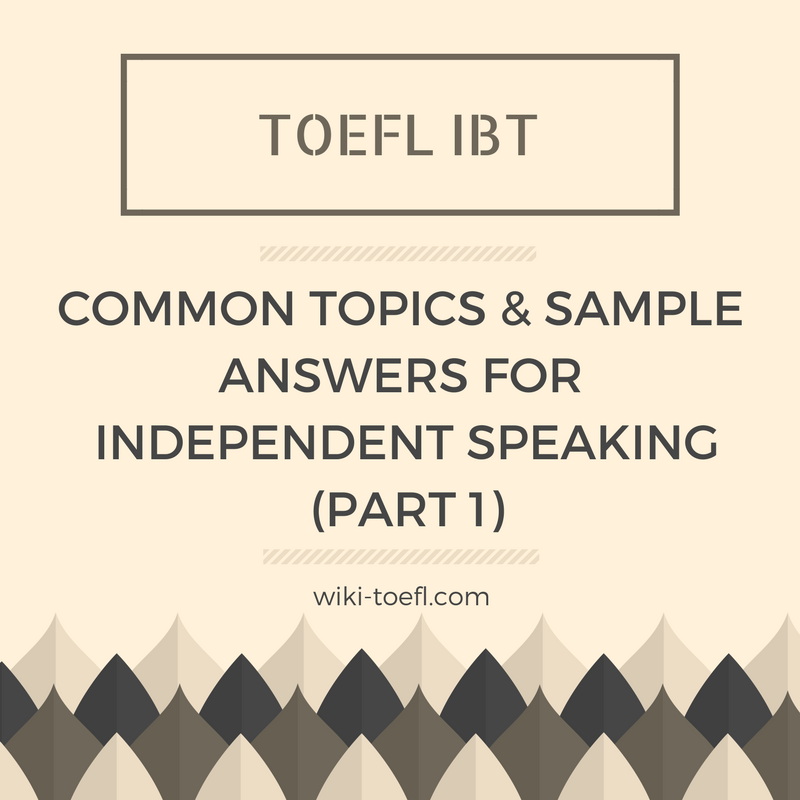 Below is a list of some common topics that you might confront in the TOEFL iBT speaking part 1. There is a sample answer and vocabulary instruction attached to each topic. Practice this by speaking and recording your speech. [Introduction]: My classmate, Sarah, is a kind, talented and beautiful girl. She is also my best friend for several reasons. [Reason 1]: Firstly, she is always by my side. Even when I call her at midnight just to complain about my tired day, she never refuses to spend her time. If she cannot talk at the moment, she will always get round to talking to me as soon as she is done with her stuff. [Reason 2]: Secondly, she celebrates my success. We are never jealous at each other. Instead, we help each other to achieve great things in life. [Reason 3]: Lastly, I’m always comfortable when I’m with her. I never get scared to talk about my failures because she appreciates me even on my weaknesses. [Conclusion]: For these reasons, Sarah is my best friend. Ex: The family will be at her side throughout the trial. Ex: I meant to call you, but somehow I never got around to it. [Introduction]: My favorite place to go on weekends is my grandma’s house, which is located in a countryside and surrounded by paddy fields and rivers. There are several reasons why I like it. [Reason 1]: Firstly, it is relaxing to escape from the skyscrapers in the city, where I’m living. The peaceful and off-the-beaten atmosphere has great healing effect on stress. [Reason 2]: Secondly, home – prepared meals remind me how much I am fed up with fast food everyday. Only grandma’s dishes satisfy my appetite. [Reason 3]: Thirdly, grandma is a great story teller. Her stories never cease to amaze the kids and even teenagers like me. [Conclusion]: For those reasons, grandma’s house is my favorite place to visit on weekends. Ex: He found himself surrounded by an admiring crowd. Ex: I’m fed up with this job. Ex: The government has ceased all contact with the rebels. [Introduction]: When I was a child, I had a great day in Disneyland, California, with my family. It is my happiest childhood memory. [Event 1]: We saw costumed characters, Mickey and Donald. I got character autographs. I was taken a photo with prince and princess. My parents bought the famous mouse ears for me, they were in all my photos. [Event 2]: Disneyland hosted a few parades throughout the day, as well as night-time showings of Fantasmic and fireworks. They were amazing. [Event 3]: We enjoyed the rides, Splash Mountain and Space Mountain. [Conclusion]: To sum up, because it was a perfect day in Disneyland and I had fun with my family, it is my happiest childhood memory. Ex: Throughout the year, the hotel hosts special events. [Introduction] My laptop, which is a black and elegant Asus latest model, is my most important possession for several reasons. [Reason 1]: Firstly, it contains almost all of my working and learning documents. My reports and materials collection are well-organized and stored in this laptop. If it disappears, my job and my study at school will be in crisis. [Reason 2]: Secondly, laptop allows me to increase my efficiency by using software. Some of my reports and homework, which require days to manually finish, are now completed within hours with software. [Conclusion]: For these reasons, my laptop is the most important asset to me. crisis: a situation in which something or someone is affected by one or more very serious problems. Ex: Natural disasters have obviously contributed to the continent’s economic crisis. manually (manual – adj): operated by hand, rather than by electricity or a motor. [Introduction]: My most inspired person is my aunt, Lora. She is just 2 years older than me and we grew up together.I am influenced by her several things. [Reason 1]: First, she is a real talent. She draws things while keeping it lifelike and natural. Her cartoon characters collections are as beautiful as those from famous Disney cartoons. [Reason 2]: Secondly, she never lets challenges prevent her from proving her talent. Her family did not have enough money for her to continue her art study at university so she puts her pictures on sales and draws for those who pay to earn money. [Conclusion]: For those reasons, my aunt is the most influential person in my life. Ex: The painting depicted a hall so lifelike that a casual observer might believe himself to be looking through an open door. Ex: He said this would prevent companies from creating new jobs. Do you think human activities do harm to the Earth or make it a better place?